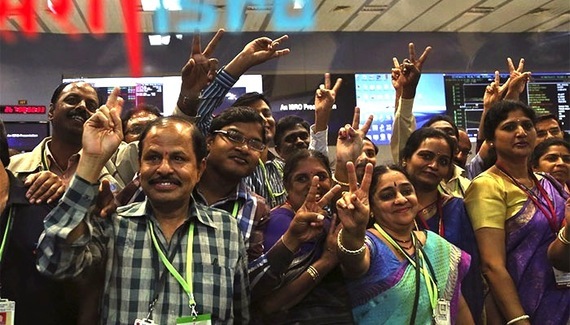 Last week, India became the first Asian nation to reach Mars, and the first in the world to do so on its first attempt. 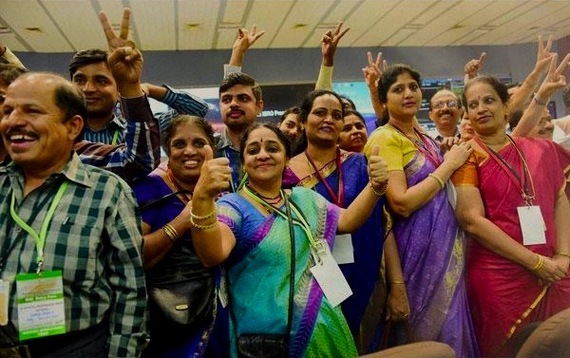 The spacecraft called Mars Orbiter Mission (MOM) in English and "Mangalyaan" or "mars craft" in Hindi was launched in November and reached the orbit on Wednesday, to much jubilation from the public. India's first interplanetary mission is all the more creditable because, at $72 million, Mangalyaan cost just a fraction of NASA's $670 million Maven, and $2 billion Curiosity Rover. It also cost less than to produce the film Gravity, and at Rs.7 or 11 cents, per kilometer, cost less than the per-kilometer cost of commuting by autorickshaw in most Indian cities. So yesterday's New York Times' comic by Heng, titled "India's budget mission to Mars" seems in poor taste. 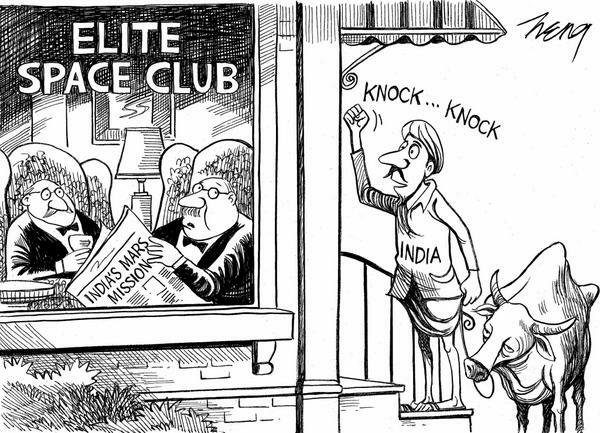 The comic depicts a poor Indian farmer in traditional garb, accompanied by a bored-looking cow, eagerly knocking on the door of "Elite Space Club". The two people in the elite space club drinking wine and reading about India's mission in the papers look perturbed and hesitant to open the door. It is also worth noting that the members of the elite space club are male, white, elderly and look wealthy. Whether meant to be funny or ironic, the racial, national and classist stereotyping is apparent. In reaching Mars, the Indian Space Research Organization (ISRO) joins the ranks of Soviet space program, NASA and European Space Agency. It not only did so on a budget, but also battling "brain drain". 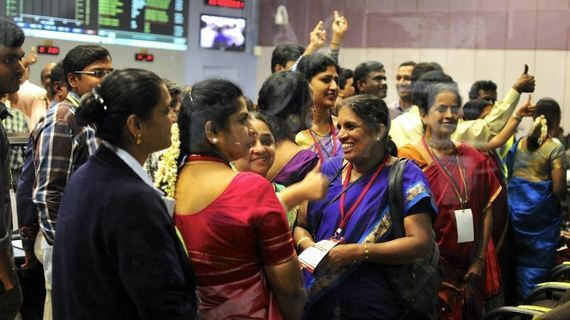 It's a commonly lamented problem that many of the country's brightest scientists and engineers end up working internationally, and tend to shy away from research in India, especially an area like space research, because it's not as lucrative. The comic strip comes at the time of Indian Prime Minister, Narendra Modi's maiden visit to the United States. Addressing a 20,000 strong crowd at Manhattan's iconic Madison Square Garden yesterday, he emphasized India's new role on the world stage and its growing economic clout. "When people ask if we still play with snakes in our country, I tell them that now we play with the mouse," Mr Modi said, drawing attention to the changing stereotype of India from a nation of snake charmers to one of technical prowess. The male engineers are wearing Western gear, while some of the female engineers are rocking traditional silk saris, the kind usually worn on special occasions, and jasmine flowers in their hair. On regular days, they work in full suits. There are no farm animals in sight at the ISRO office. And they certainly don't look desperate for membership into some secret elite club. In fact, their jubilance says it all. See, there are lots of socially and economically elite people in the world -- being elite is like winning the lottery. But only a handful of human beings in history can claim to have sent a spaceship to another planet. That is brilliance and merit. That is actualizing human potential and literally moving humanity forward -- like inventing the wheel, or, you know, sending a spaceship to Mars. One doesn't have to be a rocket scientist to understand that.